Reduce, Reuse, Recycle! Do you have a collection of favorite containers, or just want to find a frugal way to become more organized? Then this post is a must read! 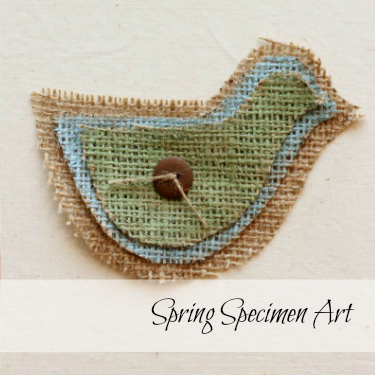 Upcycling containers is not only cost efficient, but a fun way to add a little character to your decor. 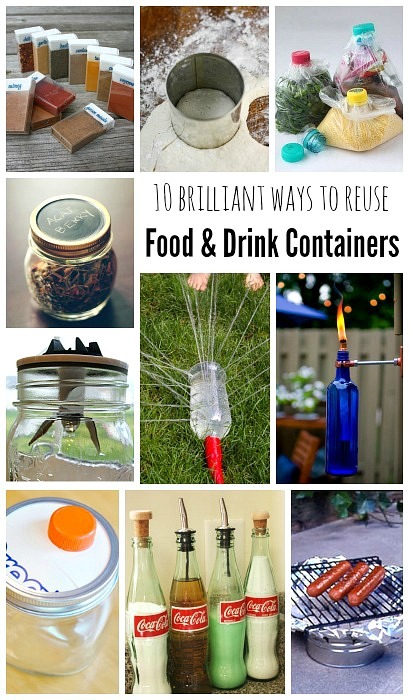 Read through this list of 10 creative ways to reuse your empty food and drink containers, and I bet you’ll find a few new ideas. 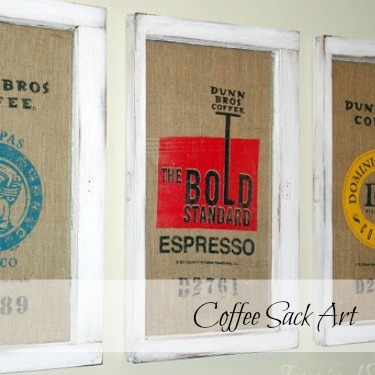 Lots of fun recycling projects for your home. I love finding new ways to reuse containers in our house. Currently all our dehydrated fruit is contained in large pickle jars, and I love using recycled materials in crafts with the kids. 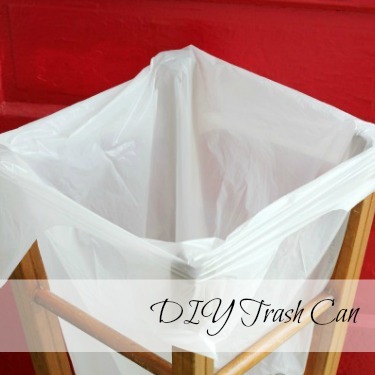 Do you have a favorite way to upcycle or recycle containers in your house? Make sure to click on the link for the full tutorial. 1. Repurposed TicTac Boxes for Travel Spices from Seattle Sundries ~ Perfect way to store your spices and seasoning for your next camping trip. 2. DIY Wine Bottle Tiki Torch from Design Sponge ~ Create a little DIY ambience in your back yard with these easy to make Tiki Torches. 3. 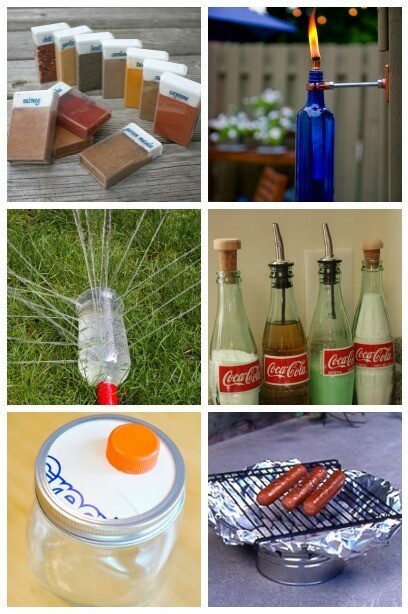 DIY Sprinkler from Housing A Forest ~ Keep cool this summer and help the kids make their own sprinkler. Yep its that easy, and your kids will love it! 4. 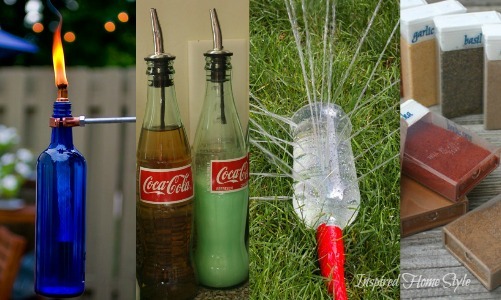 Glass Coke Bottles from Musings of a Kitchen Witch ~ Add a little style to your kitchen counter with a fun repurpose coke bottle. Perfect for holding cooking oils and dish soap. 5. 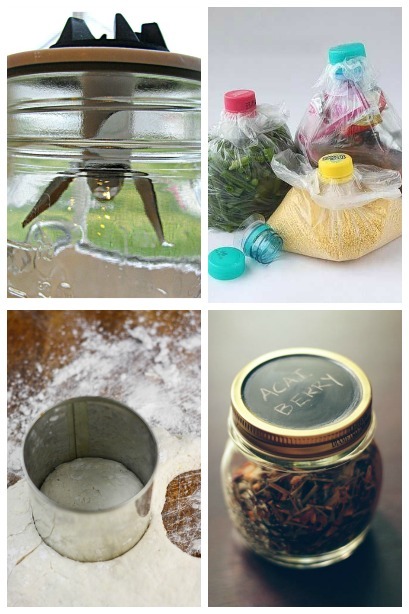 Turn a Mason Jar into an Easy DIY Dispenser from One Good Thing ~ I love this simple trick for creating a pourable container. Perfect for my collection of mason jars! 6. Tin Can Grill from Dian Thomas ~ Did you know that you can create a mini grill from a tin can? Perfect for scouting or camping cookout. 7. Mason Jar Blender Smoothie from Jenny Rambles ~ Oh wait…a mason jar fits on my blender?!? I totally can’t wait to check it out! Smoothies just got a whole lot easier! 8. A Useful Re-use of Plastic Bottle Caps from Lush Home ~ Create a tight seal on any plastic bag using a plastic water bottle. Also makes it super easy to poor out your next serving. 9. Tin Can Biscuits from Sprinkle Bakes ~ Make the perfect biscuits with a tin can! No need to buy a biscuit cutter. Just use the sharp edge of your tin can. 10. Spice Jars from Crafty MisAdventures ~ Turn baby food jars into the most adorable spice jars. The addition of chalkboard paint is my favorite part. I’m a complete sucker for Chalkboard paint! This entry was tagged Reclaimed, Recycling, Trash to Treasure. Hi! No you didn’t miss it. It was my first attempt and so I didn’t want to ccnorihle a potential disaster. lol. I used mod podge, a little water, and food coloring. Coated the inside, let it dry, and then baked in the oven on low for about 30 minutes. Pretty cool, huh?